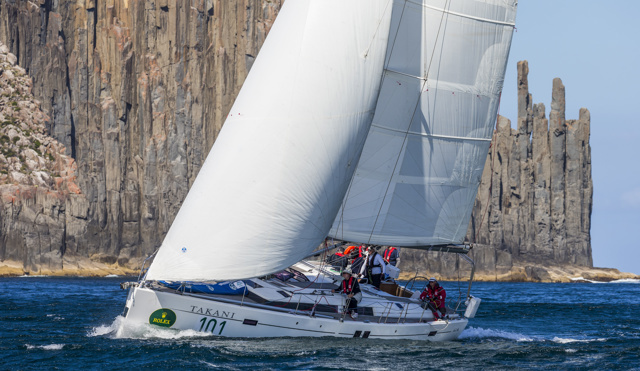 Bill Ratcliff, a member and past board member of the Cruising Yacht Club of Australia since 1962, raced his 49th Sydney Hobart only five months after breaking his neck and having recently been diagnosed with bladder cancer. “He made it – he made it to Hobart,” Katrina says. “We had a cuddle off Tasman Light and I told him I was so proud to be his daughter,” she says emotionally. “It was a special moment – I realised how much closer we had grown on this race, even more so than last year when we did the race together on Takani. “Dad navigated (his usual role), but he steered the boat around Tasman Island perfectly. His 49 years of Hobarts came into play – that was evident in his approach. Katrina and Bill were enthralled when after crossing the finish line, officials suggested they do a lap of honour past the Taste of Tasmania in the Salamanca waterfront area (it is becoming a tradition). “We couldn’t believe all the people there cheering for us – it was overwhelming – but so were all the people who came to the boat when we docked. Taswegians are so warm and welcoming. So many people came to see us – interested in the race and in our story – they congratulated Dad on his 49th. You never get a welcome anywhere else the way you get one here. “I rang Luke (her brother) close to the finish (he raced on Khaleesi), so he came down to meet us at the dock. Dad was so happy to see him. It’s a family affair – has been all our lives,” says sports fanatic Katrina whose father made sure all his kids learned to sail early through Sabots and Flying 11’s at Vaucluse 12ft skiff club. Like others in the race, Takani had her share of trials. Katrina says while she was at the helm they nearly hit a sperm whale. “We were in Bass Strait and I saw it near our transom and thought ‘how do I get around it without doing an involuntary gybe’ – I was frightened of breaking the boom if I did that. “I thought it was going to T-bone us - it looked like it would take out our rudder. I held it together and we avoided it. After, I handed the helm over and went below to Dad, I got such a shock. I told him that all that sailing he’d taught me reached its pinnacle in that moment – I can’t describe how it felt. “We also did a Chinese gybe in Bass Strait at night and went backwards for 10 or more minutes. It took us a while to get the boat under control again – we had to manage it. I always remember Dad saying, ‘It’s not what happens, it’s how you get out of it’ – and so we got out of it.